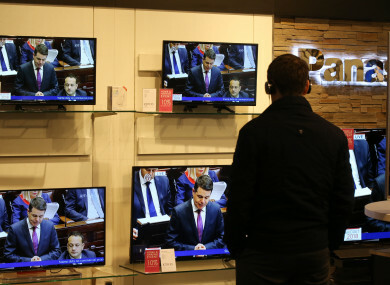 THE GOVERNMENT HAS lost a vote in the Dáil which was calling for the Strategic Communications Unit to be disbanded. A total of 85 TDs voted in favour of the motion put forward by Sinn Féin calling for the SCU to be abolished, while 49 voted to keep it. The SCU was set up last year in order to streamline government communications. It exists in tandem with the current Government Information Service (GIS). The unit came in for strong criticism earlier this month and last month as a result of the fallout from a government advertising campaign around the Ireland 2040 National Planning Framework. Questions were raised about how advertorials in newspapers were presented during the €1.5 million rollout of the plan. The SCU headed up a sweeping strategy to promote the plan across traditional and online media. Opposition politicians have been calling to have the unit disbanded. Following the controversy, a review into the SCU was ordered by Varadkar. It is being carried out by Martin Fraser, the Secretary General at the Department of the Taoiseach. The government is under no obligation to abolish the SCU following the Dáil vote. Speaking after today’s vote, Sinn Féin TD David Cullinane said that the PAC will write to the Taoiseach in relation to the SCU. “Practically the entire opposition has said enough to the Strategic Communications Unit and voted today for its disbandment,” he said. I am glad to see this Sinn Féin motion enjoying such wide support as it demonstrates that no party, bar Fine Gael, can abide the use of public monies to host party political roadshows and exploitation of the media. He said the PAC had decided to write to Varadkar today. Meanwhile, Labour Party communications spokesperson Sean Sherlock said that the Taoiseach must abide by the Dáil decision. “The people’s representatives have made their decision and views known, but the Taoiseach appears prepared to ride roughshod over it,” he said. “No wonder he is annoyed that the opposition, rightly, is examining the net effect of so much investment in adverts and PR opportunities. The Taoiseach should abide by the wishes of the House if he has any respect for parliamentary representatives in Ireland. Email “Dáil votes to abolish Strategic Communications Unit”. Feedback on “Dáil votes to abolish Strategic Communications Unit”.